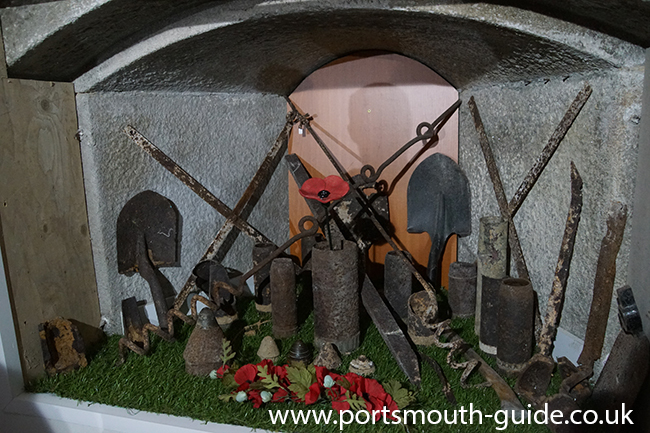 The World War One Remembrance Centre is housed in Bastion 6 off of Airport Service Road which is one of the old defences of Portsmouth. The centre displays artefacts, reproduction exhibits and memorabilia from World War One including 9,000 artefacts. It features a memorial centre and walk-through trench system as well as occasional lectures on Ypres and The Somme. The on-site shop and reception has items for sale and offers the chance to book battlefield tours of The Somme, France or Ypres, Belgium. The attraction has been put together by Charles Haskell and was moved from Fort Widley as more space was needed.